AMQP is an open Internet (or “wire”) Protocol standard for message-queuing communications. AMQP is a collective work freely licensed from many authors and participants who have signed up to the AMQP Working Group. The authors of AMQP are committed to establishing it as an international standard. 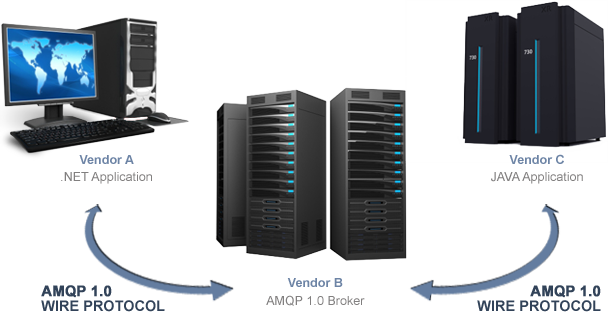 AMQP enables applications send and receive messages. In this regard it is like instant messaging or email. Where AMQP differs enormously is that it allows one to specify what messages will be received and where from, and how trade-offs are made with respect to security, reliability and performance. Systems built to integrate with AMQP are much better at functioning unattended, or “lights-out”, than other solutions. Want a real time feed of constantly updating information? No problem. Want an encrypted assured transaction? No problem. Want your message to be delivered when the destination comes online? No problem. Want to send an enormous message while still receiving status updates over the same network connection? No problem. Want that to work on all popular operating systems and languages? No problem. AMQP solves the technical part of connecting applications. All that is left for your developers to do is to focus on high-value work of reacting to those information flows.